Chinese New Year 2018: What's Your Chinese Zodiac Sign? 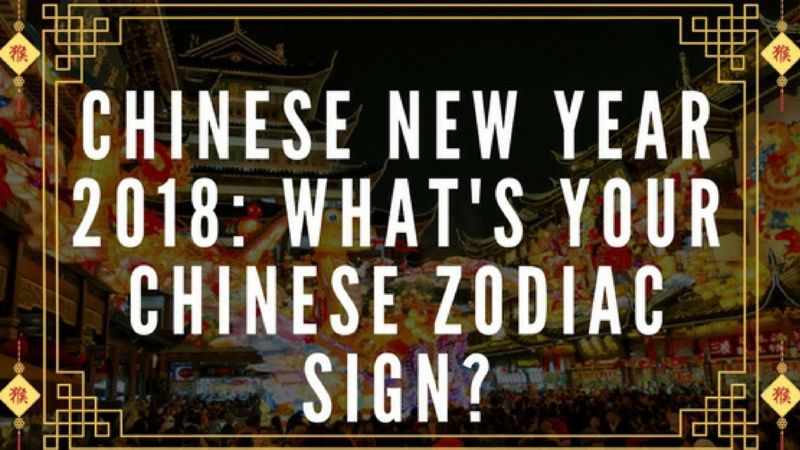 Chinese New Year 2018: What’s Your Chinese Zodiac Sign? Friday, 16th February marks the beginning of the Chinese New Year. 2018 is the Year of the Dog, according to Chinese Zodiac, which is a 12-year cycle that assigns an animal to each year. 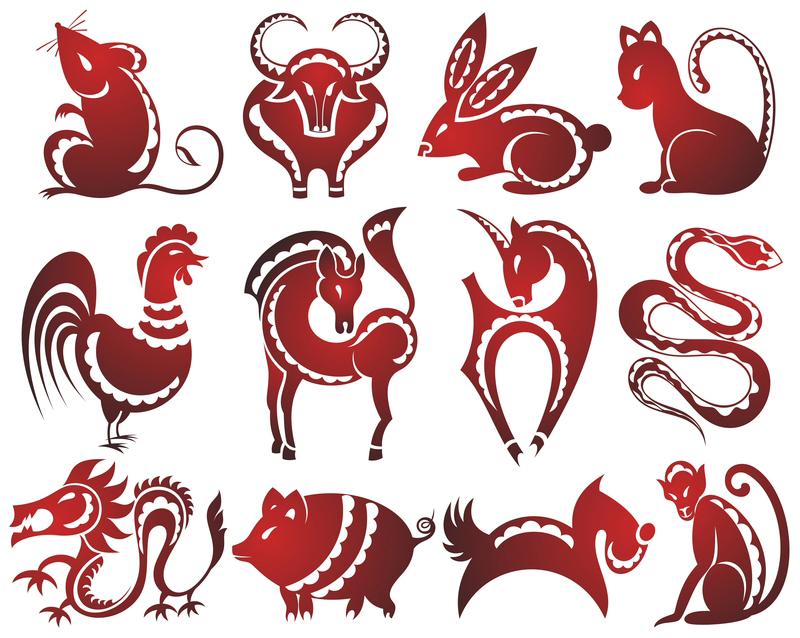 Your Chinese Zodiac sign is derived from your birth year, and is according to the Chinese lunar calendar. Unsure of which sign you are? See the years of each animal below, and see what the coming year will bring you! What’s The Story Behind The Chinese Zodiac Calendar? The story begins back in the ancient days. It was said that the Jade Emperor told all that animals they could become part of the calendar but only the first 12 who arrived first would be selected. During this time, the cat and the rat were best mates. When the news reached them, the cat said to the rat: “We should arrive early to sign up, but I usually get up late!.”The rat promised to wake up the cat so they could go together but on the day, the rat forgot because he was so excited, and went alone! On the way there, the rat bumped into the horse, ox, and tiger amongst other animals – who all happened to be much faster than him. The rat decided to hatch a plan and managed to convince the ox to carry him on his back – on one condition. The rat had to sing throughout the journey! The ox arrived first, but the rat sneaked in front of him and became the first lucky animal. By the time the cat arrived, the selection was over. This is why the cat hates the rat and will always try to chase him – Tom and Jerry style! The Rat is the first of the 12 signs, which last fell in 2008. Anyone that was born in the following years are believed to possess the characteristics of a rat: 1948, 1960, 1972, 1984, 1996 & 2008. People born in the Year of the Rat generally succeed in business as they are alert and instinctive. They are also known for their ability to prevent issues exalting. Rats are generally popular in their social circles because they know how to adapt to different environments. However, one of the most negative traits of those born in the Year of the Rat is that they are stubborn. Anyone born in the Year of the Rat is likely to form good relationships with those born in the Year of the Dragon, Rabbit, or Ox. However, the Chinese Zodiac believes that Rats are bad matches for anyone who was born in the Year of the Rooster, or Horse. 2018 is predicted to be a relatively stable year for those born in the Year of the Rat. They can be expected to perform well in their career and be rewarded for it. Due to their sensitive personalities, it is likely that they will have a few disputes in 2018! The Ox is the second of the 12 Chinese zodiac signs, and last fell in 2009. The characteristics of an Ox are believed to be possessed by those who were born in the following years: 1949, 1961, 1973, 1985, 1997 & 2009. People born in the Year of the Ox tend to be straightforward and honest, making them great leaders. Oxen don’t let what’s going on around them affect them. However, they can come across rude at times as they tend to be less talkative than other signs. Anyone born in the Year of the Ox is likely to get along great with Roosters, Monkeys, and Rats, as all these signs place a strong emphasis on family values. However, it is likely that Oxen will clash with anyone born in the Year of the Sheep, Horse, Dragon and Tiger as they are all stubborn. 2018 is set to be a good one for anyone born in the Year of the Ox. Any single Oxen may meet the love of their life this year. However, they are advised to keep an eye on their bank balance. The tiger is the 3rd sign of Chinese Zodiac. If you were born in the following years, then it is believed you possess the traits of a tiger: 1950, 1962, 1974, 1986, 1998 & 2010. Tigers are known for being brave and confident. Other people find it easy to trust people born in the Year of the Tiger. However, the most negative characteristic of a tiger is that they like to show off. Anyone born in the Year of the Tiger is likely to form strong bonds with Pigs, Horses, and Dragons as they are all driven by money. However, according to the Chinese zodiac Tigers will clash with anyone born in the Year of the Monkey, Snake, and Ox because they are aggressive signs. It should also be noted that Tigers are also considered a bad match for each other. 2018 will be a good year for Tigers as long as they stay devoted to achieving their goals. 2017 wasn’t great for those born in the Year of the Tiger, so it’s likely they will make bold choices this year. However, they shouldn’t let their health suffer and take regular exercise. The 4th sign of the Chinese zodiac is the rabbit. Those born in the following years possess traits of rabbits: 1951, 1963, 1975, 1987, 1999 & 2011. People born in the Year of the Rabbit are usually sensitive and graceful. Therefore, they are considered to be the most romantic of all the signs. However, rabbits tend to be indecisive, so they have a habit of missing opportunities. People born in the Year of the Rabbit are best paired with Pigs, Dogs, Monkeys, and Sheep as these are all romantic signs. Rabbits are likely to clash with anyone born in the Year of the Rooster and Snake as they don’t value stability. 2018 will see little change in the lives of those born in the Year of the Rabbit. However, they should work to make the most of every opportunity that comes to their door, as this could cost them their soul mate! The Year of the Dragon is the fifth of the 12 Chinese zodiac signs. The Dragon is hugely symbolic in Chinese culture and therefore the Year of the Dragon is said to be the most special. Anyone born between in the following years was born in the Year of the Dragon: 1952, 1964, 1976, 1988, 2000 & 2012. People born in the Year of the Dragon tend to be excitable and intellectual. They have strong morals than other signs. However, they have a tendency to be arrogant at times, more so in females. Dragons are best matched with those born in the Year of the Snake, Tiger, or Rat as they place high importance on family values. People born in the Year of the Dragon are likely to clash with Dogs, Sheep, and Oxen as they are likely to hold grudges. 2018 is predicted to be a good year for Dragons. It is likely that will progress in their career, which should mean they have money to enjoy life. It is unlikely that people born in the Year of the Dragon will not face any major difficulties in 2018. The Year of the Snake is the sixth of the 12 Chinese zodiac signs. Most people in China fear snakes and think they bring danger. You are considered to be Snake if you were born in: 1953, 1965, 1977, 1989, 2001 & 2013. People born in the Year of the Snake tend to be witty and wise. More often than not they are talented artists and writers. However, they have a tendency to be paranoid. Snakes are best matched with Roosters and Dragons as they value long-standing relationships. People born in the Year of the Snake are likely to clash with Pigs, Sheep, Rabbit, and Tigers as they are all suspicious signs. It should also be noted that people born in the Year of the Snake are not likely to be good matches for each other. 2018 is likely to be a year of highs and lows for snakes. It is predicted that they will face some difficulties in their career, but will overcome them by the end of the year. Everything else will be steady in the life of those born in the Year of the Snake. The Year of the Horse is the seventh of the Chinese Zodiac signs. If you born in the following years, you are a Horse: 1930, 1942, 1954, 1966, 1978, 1990 & 2014. People born in the Year of the Horse tend to be active and energetic. They are likely to be extremely animated. However, Horses can be self-centred at times. Horses tend to match best with people born in the Year of the Tiger and Goat. However, they are likely to clash with Rats, Oxen, Horses and Roosters. People born in the Year of the Horse are likely to come into money in 2018. They are likely to make good progress in their career. However, they will need to be alert at all times to ensure they don’t suffer any misfortunes. The eighth sign of the Chinese Zodiac is the Goat. If you were born in the following years, you are believed to possess the characteristics of a Goat: 1931, 1943, 1955, 1967, 1979, 1991, 2003 & 2015. People born in the Year of the Goat tend to be calm and gentle. They are likely to be sympathetic. One of the Goats major drawbacks is that they can be extremely shy. Those born in the Year of the Goat tend to match best with Rabbits, Horses and Pigs. They are likely to clash with people born in the Year of the Ox, Dragon, Snake, and Dog. 2018 is likely to be a good year for Goats. They are expected to come into good fortune. It is unlikely that they will face any major difficulties this year. 2016 is the Year of the Monkey and will begin on 8th February, and end on 27th January 2017. The monkey is the 9th sign in the Chinese zodiac calendar. People born in the following years are believed to possess the traits of a Monkey: 1920, 1932, 1944, 1956, 1968, 1980, 1992, 2004 & 2016. People born in the Year of the Monkey are likely to be smart and witty. According to Chinese zodiac Monkeys are mischievous. However, the can sometimes take a ‘joke’ too far. Those born in the Year of the Monkey will match best with Oxen and Rabbits. They should avoid people born in the Year of the Tiger and Pig. 2018 is expected to be a good year career-wise for Monkeys, and can be expected to be rewarded financially. The Rooster is the tenth sign in the Chinese zodiac cycle. If you were born in the following years, you are likely to possess the characteristics of a Rooster: 1921, 1933, 1945, 1957, 1969, 1981, 1993, 2005 & 2017. People born in the Year of the Rooster are likely to be honest and bright. According to Chinese zodiac they are ambitious. However, they are also likely to be impatient. Roosters are best suited to those born in the Year of the Ox and Snake. However, they should avoid Rats, Rabbits, Horses and Dogs. It should also be noted that people born in the Rooster are bad matches for each other. 2018 will not be the best year for Roosters. It is likely that their personal finances will not be as good as in 2017. Those born in the Year of the Rooster should expect some changes in their work. The Dog is the eleventh sign in the Chinese zodiac cycle. If you were born in the following years, it is likely you possess the traits of a dog: 1922, 1934, 1946, 1958, 1970, 1982, 1994, 2006 & 2018. People born in the Year of the Dog are normally independent and loyal. They are likely to be good at making decisions. Dogs are also very sensitive. If you were born in the Year of the Dog, then you are best suited to Rabbits. You are likely to clash with people born in the Year of the Dragon, Sheep and Rooster. 2018 will be a good year for those born in the Year of the Dog. However, they should expect to have some minor conflict with their partner. The Pig is the twelfth and final sign of the Chinese zodiac. If you were born in the following years, it is likely you possess the traits of a Pig: 1923, 1935, 1947, 1959, 1971, 1983, 1995, 2007 & 2019. If you were born in the Year of the Pig, you are likely to be considerate and responsible. You are also considered to be independent. However, Pigs have a tendency to be lazy. People born in the Year of the Pig are best suited to Tigers, Rabbits, and Sheep. Pigs are likely to clash with people born in the Year of the Snake and Monkey. 2018 will be a better year for Pigs than 2017. It is predicted that they will do well in their career and gain financial reward. However, as people born in the Year of the Pig have a tendency to be lazy, they need to ensure they get adequate exercise.